North Carolinians and impacted community members breathed a sigh of relief after hearing of the N.C. Department of Environmental Quality’s decision that Duke Energy’s six remaining coal ash sites not already slated for cleanup must be fully excavated. Those directly affected by Duke’s negligence have been fighting for this result for years and it is surely a victory. On April 1, the DEQ issued its decision to require Duke Energy to fully excavate the six coal ash sites across the state. Though citing “rigorous scientific review” as the main proponent for the decision, it should be emphasized that without the tireless efforts of affected community members, this outcome could not have been achieved. Over the years, thousands of North Carolina citizens have shared their stories, experiences and concerns about toxic coal ash dumped in unlined, giant pits across the state. Impacted residents and allies have attended numerous rallies and press conferences at courthouses, DEQ headquarters and the General Assembly. These community members have also written thousands of comments, spoken at dozens of hearings and have had their voices heard on national platforms like CNN and the New Yorker. The governor and DEQ officials have finally listened. North Carolina will now join Virginia and South Carolina in eliminating the unsafe storage of coal ash. By August 1, Duke must submit excavation plans to DEQ, which will be finalized the plans later this year. It’s probable that Duke will request that the state allow it to pass the cost of excavation onto ratepayers, now estimated to add a likely inflated total of $4-5 billion to the total cost of coal ash cleanup of all sites across the state. Appalachian Voices, partner organizations and impacted residents stand with all Duke’s ratepayers and oppose this plan. The estimate is staggering for the average North Carolinian, however, for the largest energy supplier in the nation, the cost would be easily met. Duke took in an estimated $2.4 billion in 2018 alone, according to the company’s annual report. The cost of cleanup could be absorbed each year during the cleanup, projected to last more than a decade at each site. In response to the announcement, Duke highlighted the potential costs and stated that it cannot meet DEQ’s deadlines for coal ash cleanup with full excavation. Forming excuses and finding ways to work around the paying for its own negligence is not new for Duke Energy. In 2016, the company heavily influenced House Bill 630, which provided an avenue for DEQ to downgrade the risk classification of coal ash ponds from intermediate to low — and reducing the level of cleanup required — as long as Duke provided a permanent source of clean water source to those affected by contamination within a half-mile of the ponds outer boundary. Duke connected 960 homeowners and businesses to municipal water lines while three of the six communities living with contaminated water would instead receive filtration systems. Around the same time, Duke Energy began to “pay off” or compensate consumers in exchange for relinquishing their right to sue the energy conglomerate for damages to health or property. When this bill was passed, the company was still denying any responsibility for the contaminated well water systems despite independent water testing displaying high levels of contaminants in addition to the multiple clean water act violations Duke has committed over the years. Who will pay for cleaning up coal ash contamination? This week, Democrats in the N.C. House of Representatives filed legislation preventing Duke Energy from imposing rate hikes stemming from coal ash cleanup onto consumers. Republican lawmakers do not want to be on record for voting against a bill that would spare electric customers the burden of cleanup costs— the ratepayer protection bill will most likely languish in committee and never make it onto the floor. In 2018, N.C. Attorney General Josh Stein and Sierra Club both appealed Duke Energy’s proposed rate increase, with Stein stating that “[the proposed rate increase] penalizes customers for mistakes Duke made in its ash operations. Those mistakes allowed ash from Duke plants to seep into rivers, lakes and groundwater.” Another proposed rate hike, which is almost certain, will be the catalyst for yet another court dispute. Duke’s estimated cost of excavation is likely inflated and will not be the final total. In Virginia, Dominion Energy’s original estimate of between $2.6 billion and $6.5 billion was ultimately reduced to between $2.8 billion and $3.4 billion. In South Carolina, Dominion’s excavation of coal ash was completed ahead of schedule and under cost estimates. As a result, not only did the state see an immediate reduction in pollution levels, but there were economic benefits to the cleanup. Hopefully this victory will ultimately empower more communities across our state and region who are advocating for their own justice to continue their fight and achieve what the neighbors of Duke Energy’s coal ash ponds across North Carolina have achieved. 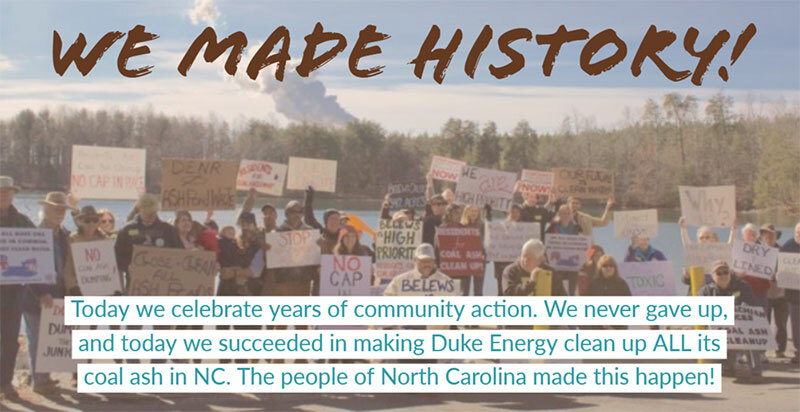 No matter what form the pushback from Duke Energy will take, these communities deserve to celebrate this win that was assured to be impossible — and they did.